In 2010, I learned about the California Parent Trigger law introduced by retired Senator Gloria Romero. This California parent empowerment law gives parents the legal power to improve the educational experiences of their children. As a result of this California parent empowerment law, I was awakened to “hope” for Connecticut marginalized children, knowing that there was a law on the books that can now help black parents, like me, help our children who are trapped in schools that cannot or will not ensure our children access to a safe and quality education. In the same year, the Connecticut General Assembly Black and Puerto Rican Caucus introduced a Connecticut version of the Parent Trigger law into the legislative session on behalf of majority Black, Brown and low income parents. We were met with so much resistance from both of our teachers unions. As a “newbie” parent leader and justice in education advocate, I was perplexed by this resistance because I, as a parent and active voter, didn’t vote for any of these public employee , I voted for an elected official that was supposed to represent my interests and the interests of my child and all children. It was this experience, as a parent of children in a traditional public school, that made me realize that the two Connecticut teacher unions, American Federation of Teachers (AFT), a Connecticut affiliate and the Connecticut Education Association had entirely too much of a monopoly over the public policy process. They have such a strong hold and undue influence over the legislative process that AFT felt comfortable enough to hold a national training on “How To Diffuse the CT Parent Trigger” with my organization’s name in the document. 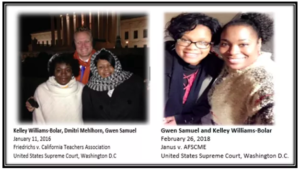 As a Black parent, I had the distinct honor of attending Supreme Court Hearings Friedrichs v. California Teachers Association argued January 11, 2016 and Janus v. AFSCME argued February 26, 2018. Both cases challenge the constitutionality of compulsory union dues. Like some parents, they too are tired of being compelled by law to pay into a system that doesn’t serve their interests or the interests of their families. First, NO ONE should be forced to pay dues for Political Activity they don’t agree with. In addition, NO ONE should be retaliated against when they don’t agree with their own unions political agenda . Before today’s Janus decision, unionized teachers like Rebecca Friedrichs was forced to pay for “other people’s agenda” through forced union dues. They have lived through some of the same pain of parents, especially Black and Brown parents and poor families that are forced to send their kids to schools that are unsafe and/or not meeting the educational, social and emotional needs of their child! Bottom line, freedom means just that – freedom. And in my opinion, forced anything & freedom cannot co-exist! Click here to learn more about Gwen Samuel.